I am so excited the weekend is finally here! And I have time to cook! 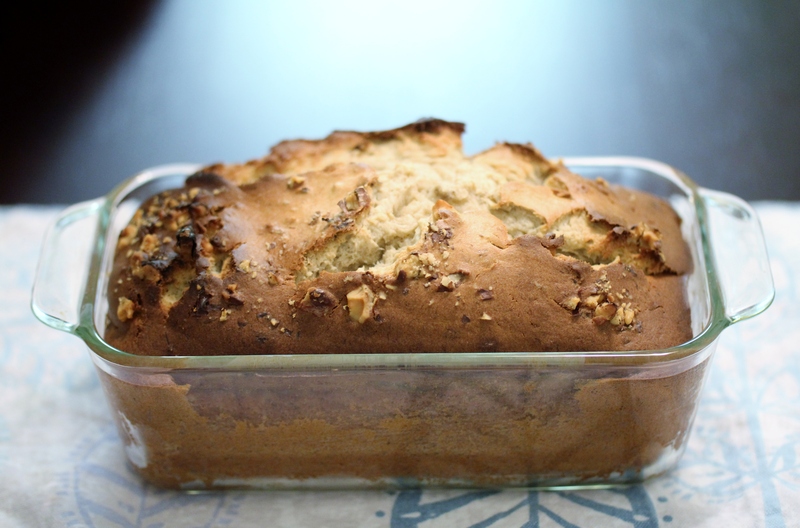 When I came home from work, the fragrance of our week old bananas hit my nose, and I decided to make banana nut bread. To me, banana nut bread is comfort food. You can have a slice for breakfast, with vanilla ice cream as dessert, or a midnight snack. 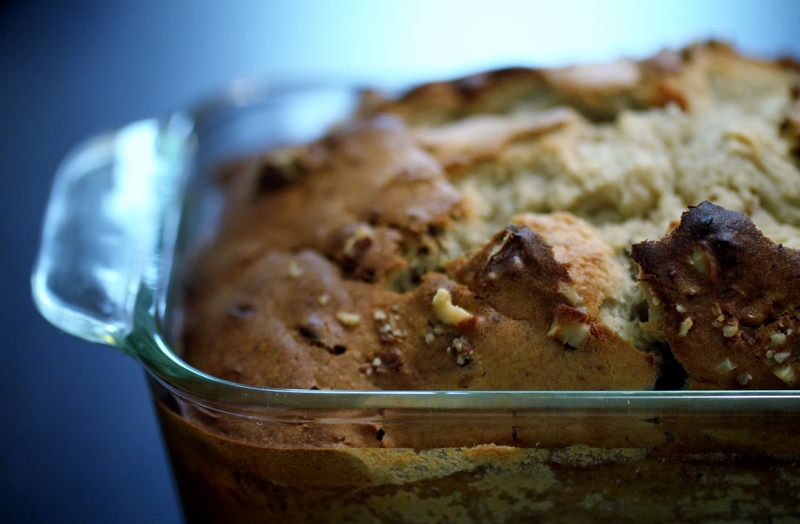 Banana nut bread tastes most delicious right out of the oven. If baked correctly, it should be moist with a hint of sweetness. Many years ago, I discovered the secret to retaining moisture in the banana bread is cream cheese. Who would have thought?! Well, whatever way you like your banana nut bread, enjoy! Preheat your over to 350ºF. 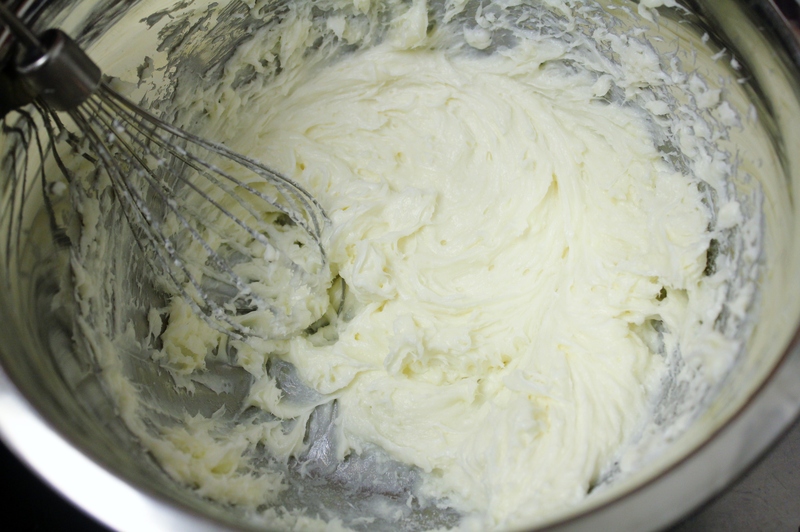 Beat cream cheese, butter, and sugar in a mixing bowl with an electric mixer until well blended. Add banana and eggs, and mix well. Sift in combined dry ingredients and blend well. 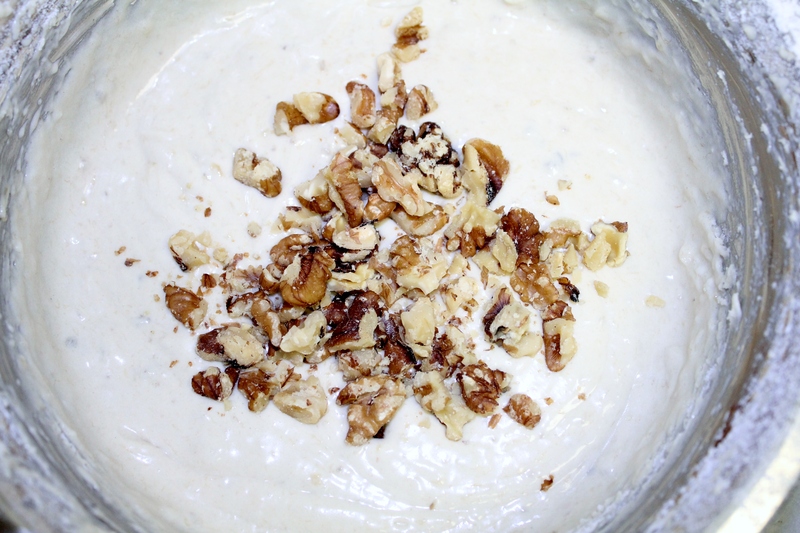 Stir in vanilla extract and walnuts. 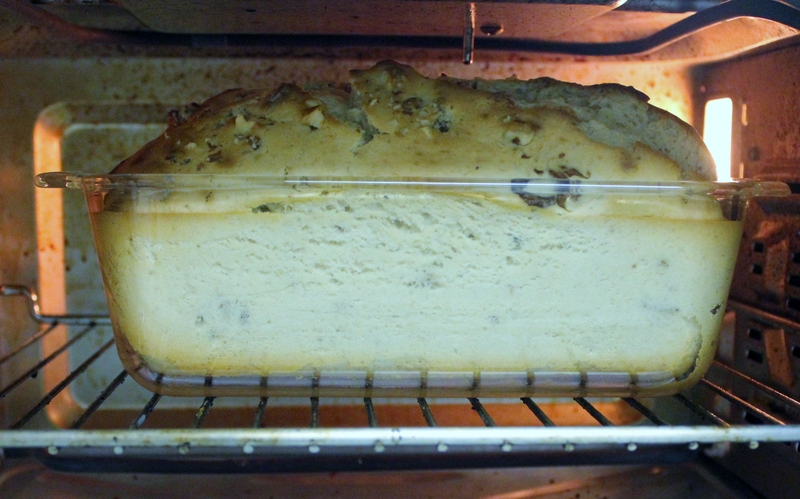 Pour into greased 9×5 inch loaf pan and sprinkle some crushed walnut pieces on top. Bake for 1 hour or until wooden toothpick inserted in the center comes out clean. Cool 5 minutes before serving. Enjoy! am so excited the weekend is finally here! And I have time to cook! When I came home from work, the fragrance of our week old bananas hit my nose, and I decided to make banana nut bread. To me, banana nut bread is comfort food. You can have a slice for breakfast, with vanilla ice cream as dessert, or a midnight snack. Banana nut bread tastes most delicious right out of the oven. If baked correctly, it should be moist with a hint of sweetness. Many years ago, I discovered the secret to retaining moisture in the banana bread is cream cheese. Who would have thought?! Well, whatever way you like your banana nut bread, enjoy! 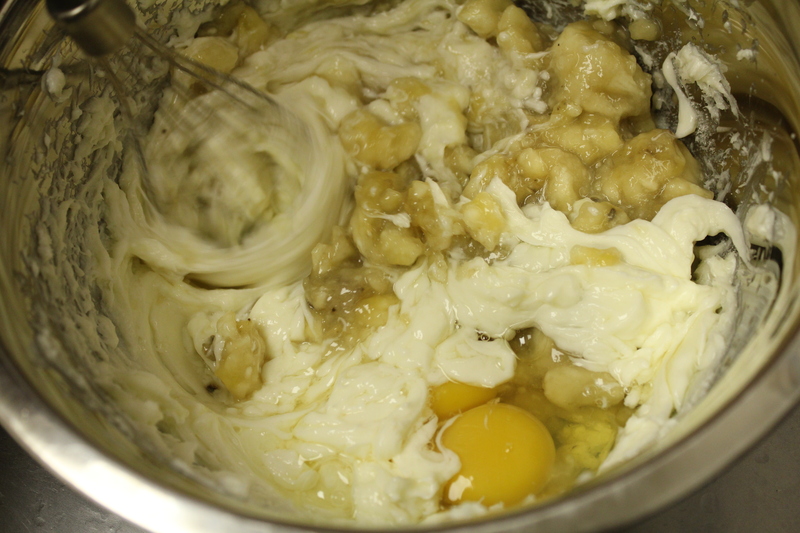 Beat cream cheese, butter and sugar and butter in large bowl with electric mixer on medium speed until well blended. Add bananas and eggs; mix well. 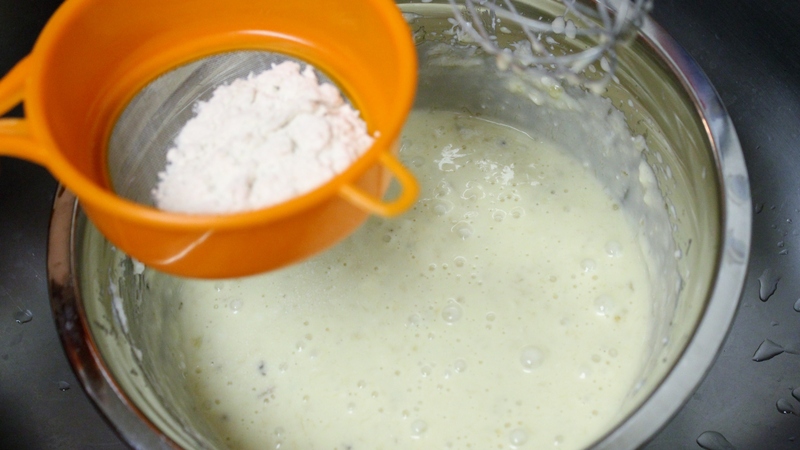 Shift in combined dry ingredients; mix just until moistened. 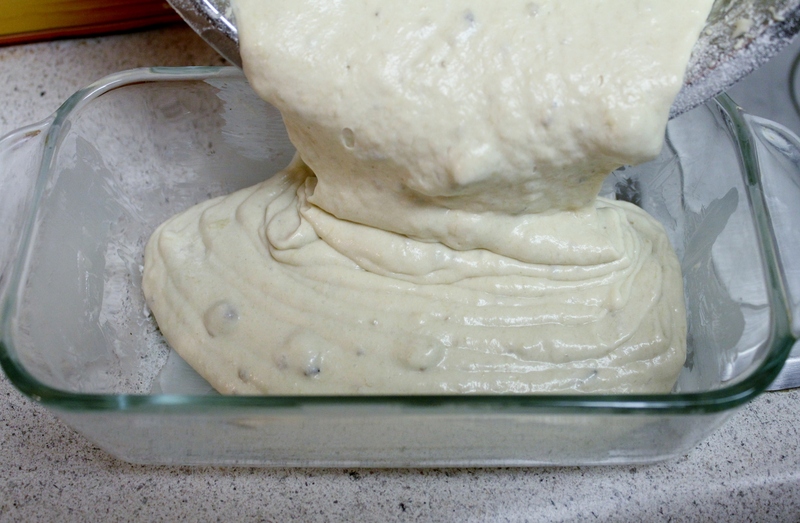 Pour into greased 9×5-inch loaf pan. Bake for 1 hour or until wooden toothpick inserted in center comes out clean. Cool 5 min before serving. Store any leftover bread in refrigerator.